This title is directed primarily towards health care professionals outside of the United States. As one of the three major diseases in the Western world, and one that is on the increase, care of people with diabetes is crucial to the entire healthcare team. 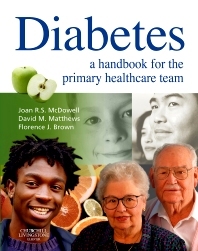 This book provides a comprehensive text on the management of the person with diabetes in the community and will be invaluable to dietitians, podiatrists and GPs and especially to practice nurses, district nurses and health visitors. It has been written from a community perspective by a multiprofessional team and advocates principles of care based on the latest research. It focuses on the role of the professional in assisting in self-care of the individual with diabetes. It also includes caring for the person in long-term care settings, for example, nursing homes.